I don't have time to do this juicy subject justice right now, as I'm a bit under the weather, but there's a very interesting looking exhibit opening this week at the Museum of Modern Art in Queens, "Fashioning Fiction In Photography Since 1990". One of the ongoing themes in my posts has been the contradictory artfulness of the best fashion photography out there, and this show sounds almost tailor made for a pop culture, art and photography junkie like me. I've been aware of other museum retrospectives and fashion-themed shows, and fashion lifestyle images have been part of single artist retrospectives and shows exploring broader themes for many years now, but this is one of the first shows I've been aware of to tackle head-on the intersection of art and fashion photography. I know better than to get my hopes up too much, though, regarding the scale and ambition of any such exhibit, given the curious sniffing about fashion images that comes from most art and political circles (including many of the artists themselves, who often find their fashion work a necessary evil). I hope to get to NY to see the show myself before its run ends in June, but there are two interesting early write-ups on the show: Art That Wears $780 Shoes in the New York Times (which is more of a roundtable discussion between fashion and art experts), and a review by Vince Aletti in the Village Voice. The Times discussion is entertaining, but despite its length, it mostly dances around the issues raised by the exhibit beyond the most obvious hook, which is the art of storytelling that '90s fashion photography and conceptual photography share. Aletti notes something I'd feared about a show like this: the air of mocking satire hanging over the show (just to make it clear that no one actually, ahem, approves of fashion images). Nevertheless, the confluence of photographers like Tina Barney, Nan Goldin and Mario Sorrenti can't help but make for an interesting show, and given that the artists are each represented by a single fashion campaign with multiple images (to bring out the storytelling angle more explicitly), rather than freeze-drying and isolating individual fashion images to make them more museum-worthy, should make for an exhibit that stimulates some thought...maybe even opens up some minds. Both the Times and the Voice highlight the photographer that I would have guessed would be the centerpiece of an exhibition like this: Philip Lorca di Corcia, one of the greatest and most enigmatic photographers playing in both art and fashion photography over the last decade. 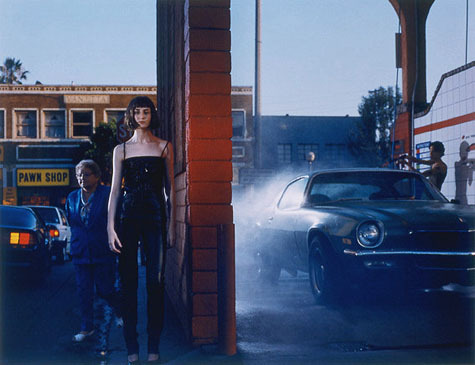 There's a lot more to say about diCorcia, and I hope to be able to share some of my thoughts tomorrow if I'm feeling better. I don't think there's anybody living who has done everything throughout their life perfectly in every way. People I doubt that the world be perfect, but often act as if they were. make mistakes in different ways, making mistakes is human. but even so the world is beautiful with all of us living in it.